I could be wrong, but after looking through the book in order to write up this page I could only find one invention. The invention was pretty mind-blowing, though, so perhaps that makes up for things. This mind-blowing invention is called, simply, the Atmosphere-Making Machine. The atmosphere-making machine is one of Tom's most outstanding inventions. Tom puts it to good use on the phantom satellite, too -- equipped with only one, he managed to set up a breathable, livable, viable atmosphere -- complete with rain and plant life -- on a dead asteroid. "Now what in tarnation would that be?" Chow asked, staring at an object on Tom's workbench. "It looks like one o' them merry-go-round lawn sprinklers--or a silver spider, mebbe." Tom laughed. "It's a model of an atmosphere-making machine, Chow." "You mean, a contraption fer makin' air?" A frown wrinkled the cook's forehead. "But brand my spurs, why bother makin' air? Ain't we got plenty to breathe already?" "Here on earth we do. But on the moon and some [some?] planets, space travelers won't find any, so they'll have to make their own." "Well, brand my ox-eegen mask!" "Speaking of oxygen," Tom said with a grin, "my machine will not only shoot out a mixture of oxygen and nitrogen--it will also make the stuff cling together, so that it can't drift away when there's not enough gravity to hold it in place." Chow scowled at Tom suspiciously. "An' just how do you make gases stick together? Add a little glue mebbe?" Tom chuckled. "By using Inertite." This was a special paint that Tom had concocted from rocks taken from the Caves of Nuclear Fire in Africa. "You see, when Inertite is exposed to radioactivity, it generates a field of high-energy waves. And the waves, in turn, make the molecules of gas attract one another." Chow's face creased into a cheerful grin. "I don't savvy a word of it, son, but if you say so, I reckon it must be true!" "Same here!" Bud groaned. "It's way over my head!" "It'll be way over all our heads," said Tom, pointing to a blueprint of his machine. "The 'spider' will be suspended about five hundred feet in the air." Bud looked mystified. "But what holds it up?" "Radib--that's short for Radioactivated Directional Ionic Beam. The pressure of this stream of charged particles supports the machine just like a Ping-Pong ball on a waterspout. And of course the beam also irradiates the Inertite." Everyone ate a meal of compressed rations, then piled out of the tanks and went to work. As Tom worked with the crew erecting the atomic reactor, Bud supervised the men who were installing the radib generator, powered by one of Tom's solar batteries. The atmosphere spreader was then lifted on the ionic beam, and the gas feed line was hooked up to the bank of compressed oxygen tanks. "All set, skipper," Bud reported. "Fast work, fellows!" Tom congratulated the crew. Bud grinned. "What else did you expect with Whiz Barclay bossing the job?" "Watch it, boy! You'll break an arm patting yourself on the back!" Tom chuckled. He checked various connections, then flicked a switch and opened the gas valve. Instantly the atmosphere spreader whirled into motion, becoming a silvery blur. "How soon can we take off our space suits?" one of the workers wanted to know. Tom replied, "First we must get the reactors working to produce enough gas to blanket the satellite. If all goes well, we'll be breathing the stuff by tomorrow and we'll notice a difference before dark tonight." Everyone now turned to finishing the atomic reactor, except Kent, who went scouting for a good supply of iron oxide ore. This would be used in the atomic furnace to produce oxygen for the atmosphere-making machine. The young metallurgist returned shortly with several reddish chunks. "There's an adequate supply up there, Tom," he reported. Bud, who was standing by, frowned dubiously. He glanced up the rocky slope where Kent had found the ore, then back to Tom. "But how do we get the stuff down here to the pile--bucket brigade or wheelbarrow?" "You're getting tired, Whiz. Better take it easy." Tom patted his pal's arm sympathetically. He grinned and added, "Just watch." Taking a small charge of explosive from one of the tanks, Tom headed up the slope, scouted around a bit, then planted the charge at a strategic point. After clearing the area, he touched off the blast. Boom! A geyser of dirt and rocks sprayed upward, to shower down in all directions. A miniature landslide followed this as tons of the reddish rock came pelting down the slope. "Hey, I heard that, skipper!" Bud yelled in amazement. This was the first "natural" sound he had noticed since arriving on Little Luna. Tom nodded happily. "We're building up enough atmosphere to carry sound waves," he replied excitedly. "And here's all the rock we need, just waiting to be shoveled into the reactor." Within two hours, the reactor was finishing and a chain stoker was rigged up to feed in the rocks. Tom started the small atomic reactor. As the current was generated, it electrolyzed the iron oxide and oxygen began to boil off. By this time, the tanks of compressed gas were exhausted. Tom spun a valve, permitting the gas feed line to draw oxygen from the reactor. In a matter of seconds, the little satellite was well on its way to producing its own atmosphere. "Another outstanding achievement, Tom!" Dr. Jatczak said enthusiastically. Shortly before the evening meal, Kent came into Tom's laboratory with several reddish chunks of rock, flecked with metallic glints. "Tom, I think this ore may be our best bet for producing oxygen in the atomic furnaces!" he announced excitedly. "I'll look at it under the spectrograph," the young inventor said. He took the rock samples into the metallurgy laboratory. A few minutes later both scientists were grinning happily. "Nice going, Kent," Tom congratulated him. "It's almost pure red iron oxide, plus about two percent of rare metals. It should vaporize very nicely in the atomic furnace." How feasible is it to build an Atmosphere-Making machine? This is kind of a tricky question. In theory it could be done. Huge plants, modeled after the Atmosphere-Making machine, could be set up on planets and used to turn rocks into ozone (to heat up the planet) or oxygen (to breathe) or something else. The process of terraformation would take a very, very long time, but it could be done. Tom's Atmosphere-Making machine is a few steps beyond basic terraformation, though. Its size makes the invention even more unbelievable (see p.140-141 for a picture). How could a machine that tiny turn even a small asteroid into a livable habitat in only 24 hours? The only solution would be an extremely efficient atomic smelter, and even then I don't see how it could be put to such extraordinary use. And that brings up another point. Wouldn't Tom's machine eat up an awful lot of rocks? Extracting oxygen from rocks is not an exceptionally high-yield process, and when you have a smelter as small as Tom did the process of rock smelting could take a while unless you had a really fast process. Maybe there are ways of doing this; I'm not saying it can't be done. All I'm saying is that it would be very, very hard. The really far-out process, though, is that Inertite coating that Tom did so that the atmosphere wouldn't drift away. It's true that the atmosphere drifting away would cause problems, but how does coating the molecules with Inertite help? This question, obviously, can't be answered, since the isotope Inertite does not exist on Earth. How much impact would an Atmosphere-Making Machine have on civilization? The answer to this question rests on some particulars concerning the machine that aren't discussed in the book. How much gas can the machine produce per day? What kinds of rocks are needed? What temperature does the machine need to operate? Judging from the actions of the machine in the book, though, I get the feeling that it could be very useful indeed. Think about it. Wouldn't it be nice if you could set up a couple dozen of these machines on the Moon and in the course of a month have a livable, breathable, viable atmosphere? Future space explorers could bring a few dozen of these machines on all flights and wherever they choose to land they could just scatter a couple Atmosphere-Making machines over the planet and after a month or two have an earth-type atmosphere to move about it. The chances are extremely good, however, that the process would be far more complex than it looks. How would the machine interfere with local weather patterns? How would the machine gauge the amount of gases that already exist in the atmosphere and alter its output to create the habitat that was called for? 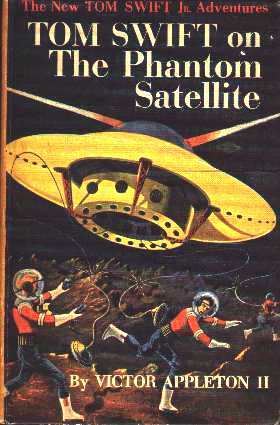 This wasn't a problem for Tom Swift because the phantom satellite didn't have any atmosphere and thus didn't have any weather patterns or atmospheric gases, but it could prove to be a problem on Mars or Venus. Still, I believe that if the machine existed, these problems could be overcome, and the machine would prove to be a great boon to space travelers everywhere.